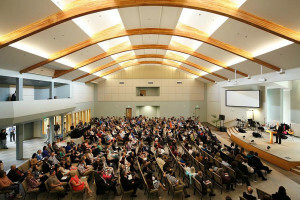 Bellevue, Washington-area Calvary Chapel Eastside has been in the works for several years. The building project began nearly a decade ago, while the assembly was still worshiping in Bellevue College on Sundays. Slowly but surely, the congregation built up savings, constructing the church building in stages over that time. They were also paying attention to the technology that would support their message in the church, choosing platforms that would set them apart and take them far into the future. These included an L-Acoustics ARCS WIFO PA system and a Roland M-5000 OHRCA Live Mixing Console. This impressive sound system was installed by nationally-known AV systems sales and integration provider CCI Solutions.